The journey commenced on 28/12/2016, 6.30 am from my home in Kottayam. My plan was to cover north Malabar and the northern border of gods own country for that I have done a good home work to find out best places for a solo trip to Kerala. The breakfast was arranged by my friend Felix in his home near Chalakkudy (Thrissur District). I reached there at 9.30 am and had breakfast with Thrissur dishes, and spent time with him and his parents there. Then resumed my journey from there to Calicut, with the eagerness to taste the traditional "Kozhikkodan Biriyani". I cruised my bike past Thrissur, Kunnamkulam, Edappal, Kuttipuram and Kottakkal etc. Around 3 pm I reached Calicut city and headed to the famous "Rahman Hotel" near to railway station for traditional Kozhikkodan Biriyani. After having tasty stomach full biriyani, I moved to Mananchira square (public park in the heart of Calicut city) for relaxing from a long bike ride on a sunny day. I planned my first day stay in another friend's home in Thalassery, whose name is Sourav alias Katt. But changed abide by Kannur, in order to reach the northern Kerala border in the early morning of the second day. I didn't prefer night drive throughout the journey because of the heavy truck traffic on National Highway 66 (formerly National Highway 17). From Mananchira square I continued my journey to Kannur; it was around 94 Km from Calicut. On the way to Kannur, I crossed famous north Kerala towns like Koyilandy, Vadakara, Mahe, and Thalassery. At around 7.30 pm I arrived at Kannur town and searched for my stay there. I chose a hotel in KK Bus terminal complex, the hotel was on the 5th floor of the bus terminal complex, so I got a nice night view of Kannur town and its suburbs. After refreshing, I went for dinner at the nearby restaurant. I came back to the room after dinner and my body was ready for a long nap to get rid of tiredness from the long journey. I set the alarm for 5.30am and drenched into a deep sleep. I woke up for the alarm tune and got ready for the second-day expedition. The second-day plan was to reach north Kerala border and return back to Bekal fort, Muzhuppilangad drive-in beach etc. From Kannur at around 6 am, I left for north Kerala border without having the morning tea which is very much needed as far as I concerned. But after starting the early morning ride, I got a thrill and which lead me to a non-stop ride to Kasargod through NH 66.The highway sign boards passed through me like Kasargode 98Km, 68Km, 38Km, and 18Km etc. I stopped at a place known as Poinachi on the highway for a moment due to nature call. I suddenly resumed the trip but the thrill of early morning bike ride through the new places was still in my mind. Reached Kasargode around morning 8.30, but I couldn't stop there because of strong desire to reach northern border of Kerala, a place known as Thalappady. I transit through Kasargod town, Manjeswaram, and Uppsala etc. Before reaching Thalappady, I halted in front of a tea shop, which offering north Indian type tea. The people sitting there were using half Malayalam and half Kannada for their communication. They enquired about my bike trip, native place etc. One thing I can surely say about my bike is, wherever I passed through, people kept on looking at my bike with some strange (Oh…look at that!!) expressions. I think the color and cruiser look is the most prominent things behind this attraction. Hats off Bajaj and its team behind Avenger family (F.L.G) and it's the best bike for visiting the places solo trip to Kerala. I enjoyed the tea by zipping it very slowly and asked about Mangalore to the vendor. He told me that Mangalore is just 25 Km from the border. After hearing this, my inner thoughts woke up and telling me to why shouldn't you go to Mangalore?, Which is very near to border. I did cruise bike to Thalappady after having tea. There was nothing much special to see except Kerala and Karnataka check post and a long queue of heavy trucks. 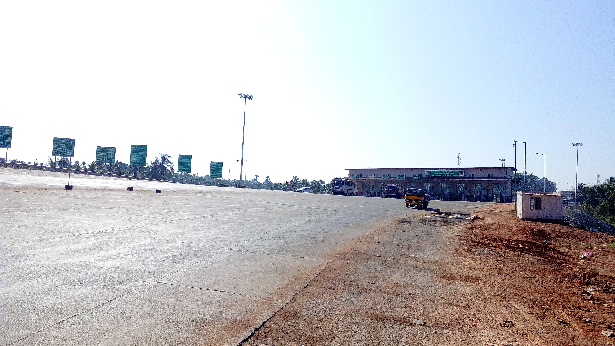 After a kilometer from Karnataka check post, there was a big toll plaza and a well maintained four lane road leading to Mangalore, seeing that I decided to go further and raced towards Mangalore. This ride was one of the most enjoyed sessions during the trip; the less traffic four lane road gave an immense pleasure of bike riding. On the way, I crossed a lengthy bridge, which constructed across the river "Netravathi", which was flowing with an abundant water source to fulfill the daily needs of Mangaloreans. After a half an hour drive I reached Mangalore city and planned to have breakfast from there. I found a traditional Mangalore restaurant, "Sree Ratna", which was on the banks of the highway. I ordered a masala dosa and fruit juice, and the hospitality was good at there. From the hotel, I moved further inside to the city and roamed around there. 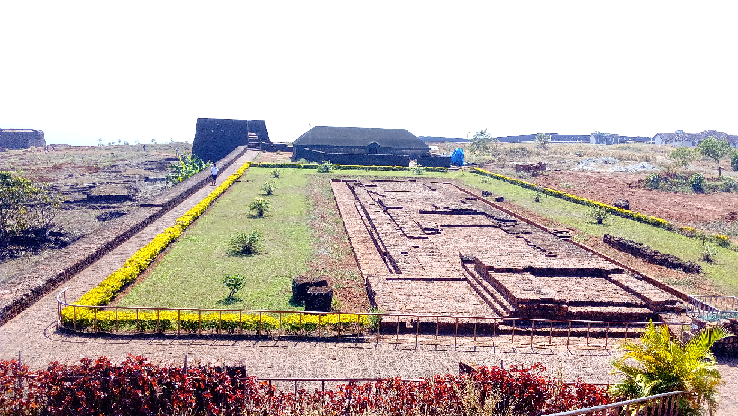 I returned from city after some time to my first destination Bekal fort, which is around 67 Km from Mangalore and 18 km south of Kasargode. 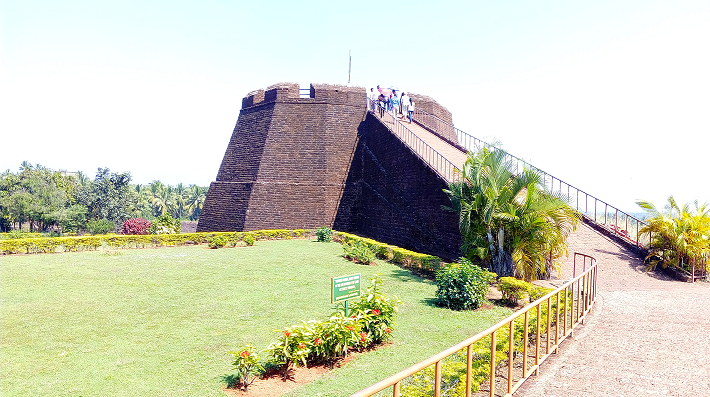 Bekal fort is the largest fort in Kerala, spreading over 40 acres and situated at Bekal village in Kasargod district. I arrived at Bekal fort around 12.30 pm, due to the sunny day I couldn't roam much around the fort. Bekal fort was a new experience to me and astonished with the view of the Bekal beach from the fort. In spite of heat from the sun, I captured most of the beautiful sceneries around there. My main aim while traveling through places in Kerala for a solo trip is to capture the beauty of the places I visit. Visiting Bekal fort was one of my childhood dreams, which I inspired from the song "Uyire Uyire", of Maniratnam movie Bombay. The entire song scenes were shot at Bekal fort and its premises, and it's a nice song too. I had my lunch, which was an Egg biriyani from a local restaurant in Bekal. 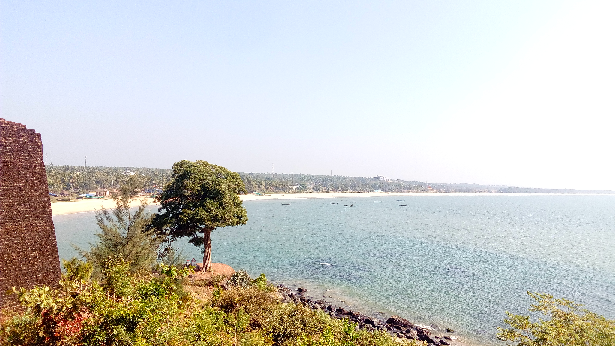 After accomplishing one of my missions, I left Bekal fort and moved to another destination, which is the Muzhuppilangad drive-in beach, 12 km south of Kannur town. From Bekal fort, I avoided the NH66 till Kanhangad and opted for the coastal road which gave the sea view while riding. From Kanhangad I entered into NH66 and rushed towards Kannur. I hurried to reach at Muzhuppilangad Beach before sunset, it's the best time for exploring it as a drive in the beach with the background of sunset. On that day evening Left Democratic Front, who rules the state organised a protest "Manushya Changala" (Human Chain) against central government along the sides of NH66 from south end to north end of Kerala at 4.30 pm. On the way to Kannur, I saw people hold their hands together and lined along the right side of National Highway 66 and reciting the pledge of their volunteers. It was a nice view along the NH 66 till reaching the Kannur town and also people were looking at my bike with a strange look. There was traffic block in Kannur town after the protest, but with the bike, I could cross the traffic very easily and reach Muzhuppilangad drive-in beach around 5.30 pm. 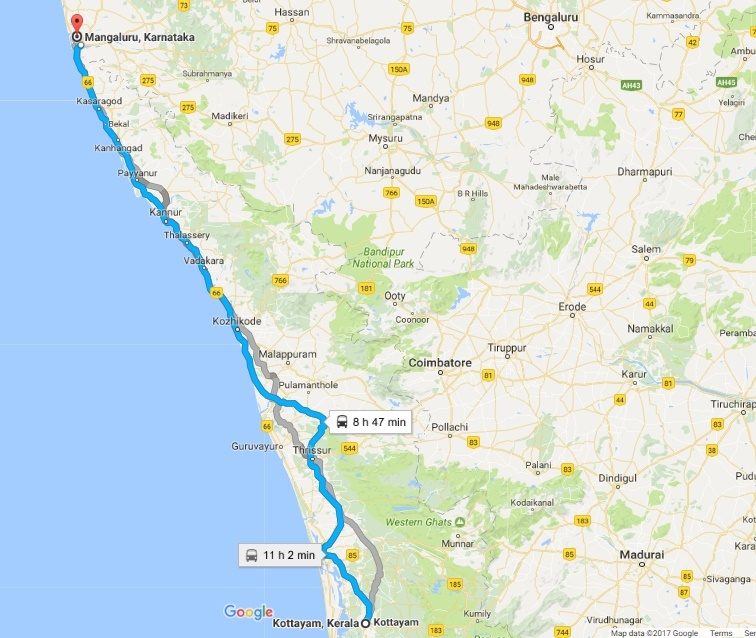 Another one of my travelling dreams was riding a bike through Muzhuppilangad drive to the beach (5.5 Km length), which is the famous and longest drive-in beach in India. In 2010, I came to Kannur with my friends for a marriage but I couldn't come here. So that was the reason I had added Muzhuppilangad beach to my list of places to visit for a solo trip in Kerala and I was eagerly waiting for this chance. There is an entry fee for vehicles, I paid that and entered into the beach. The speciality of this beach is that the sand bed is strong enough to ride vehicles. First I headed to the north side of the beach and took many photos with my mobile camera. Beach was crowded with vehicles; people were taking photos and videos of their ride and also practice driving there. I rode the bike about one kilometre through the beach and that was another mind blowing experience during the trip. I requested a fellow man to take some pictures of me sitting on the bike. He did that well and asked about my trip, and congratulated me for my passion. I spent almost one hour with the scenic beauty of sunset in Muzhuppilangad drive in beach. Next big thing was to meet my friend Saurav in Dharmadom, which is 5 Km from the beach. I came out of the beach and stopped at an evening snack shop. I had a tea and local snack "Kallummekkaya" fry. Then I went for meeting Sourav, his home is near to Dharmadom Bridge and off to boat jetty road. I arrived there soon and met him, after six years, i.e. after college, we never met. We were batchmates in TKM College of Engineering, Kollam. When I met him, he was sitting with his friends in Dharmadom beach. I spent a little moment with them and he introduced me to his friends and I explained them the best places to visit for a solo trip in Kerala which I have opted for and they were so impressed by it. Saurav insisted me to reside there at night and continue the journey on next day. I couldn't accept that because I have to reach my home as soon as possible due to "home calling". I planned to stay at Calicut on that night and resume journey on next day. So I said goodbye to Saurav and his friends and headed to Calicut. During my trip, I fuelled my bike in petrol pumps in Mahe (Union Territory). Petrol price was Rs.10 lesser than other places in Kerala. On the way back to Calicut I filled petrol into my bike just below the tank cap. And I hastened to Calicut through the busy traffic in Mahe due to congested roads. I ate dinner from a thattukada near Vadakara. At around 11 pm, I reached Calicut and took a room in a lodge near Pantheeramkavu bypass road. This was the same lodge and same room, where I stayed, while came to Calicut three months before. Due to the tiredness of bike ride, I slept as soon as I lay on the bed. That was all on my second day of the trip. Early morning I woke up and got ready for the return journey. As I was staying in Calicut bypass, I didn't face any problem with city traffic. Had a tea from highway teashop, I resumed the trip and said bye – bye to Calicut city. I crossed the Feroke Bridge over Kallayi River, also passed through Calicut University, Kottakkal, Edappal, Kunnamkulam, and Thrissur. I came to four lanes National Highway from Thrissur, the time was morning 9.30 and I was searching for vegetarian restaurants for breakfast while riding. On the highway near to Angamaly, I found a hotel and had breakfast from there. I kept on the journey after breakfast and accelerated towards my home. But later I felt sleepy while riding when Aluva reached, I halted the bike and washed my face with cold water and did warm up. After some time I felt energized and again proceeded my journey. On the way to home, I stopped the bike two three times to have juice and to get rid of dehydration from the hot day. Third-day ride was the most difficult leap of my trip. From Aluva, I passed through Kalamassery, Kakkanad, Chottanikara and Kanjiranmattom etc. This stretch was very hard due to heavy traffic, and hotness from the sun. At around 2.30 pm I reached the place, from where I began my expedition two days before. Finally the "Home sweet Home".My cousins and friends were eagerly waiting for my review of solo trip in Kerala, that was the end of Bohemian Tag Ein.